Day 3: The little lady was watching Hellboy last night and it got my pencil going. 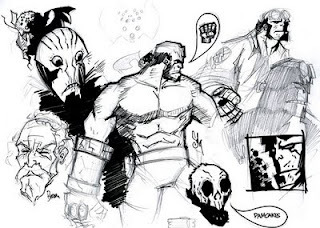 I've never really drawn Hellboy, although I love the character and Mignola's art, so what you see here is a progression. Towards the end I felt more comfortable drawing the big red monkey. Hope you like. *The winner of yesterday's sketch is Scharisse "Chorizo" Sierra. Dude Dennis... Quit calling me Chorizo all over the frigging world wide web! LOL!